Our quality teak outdoor and garden furniture products are most commonly finished in what is called a "Natural" finish. In this process, the wood is fine sanded down to a smooth feel with fine grit sandpaper and then several coats of teak oil is applied. This is the most common finish we use for our quality teak outdoor and garden furniture. Another popular finish that is used for teak outdoor furniture is what we call a "Honey" finish. The furniture is first fine sanded and then finished with teak oil and a UV protective coating we call "Lasur" Lasur is a product which penetrates the wood and gets deep into the pours of the teak. It has an elastic property and is well suited for outdoor use and very hot and dry climates. All Classic Teak quality teakwood products are manufactured from Warner Levitzson Teak Furniture specially selected from reserved production forests, carefully managed by the government forestry agency. Teak is a tropical hardwood with a beautiful golden /honey brown color when it is new. Over time, as natural teak is exposed to the elements, it gradually changes color from the honey color of new teak to a silver-gray patina which distinguishes finely aged, outdoor teak. After a while this silver-gray patina deteriorates to a dark-gray and greenish look if it remains untreated. Teak furniture, when left bare and unsanded, will fade to a natural silver-gray color. This color transformation does not affect the durability of the teak furniture or the wood itself. To maintain the smooth finish and golden brown color, you will need to sand your teak furniture regularly. To prolong the period of time needed between sandings, teak oil may also be applied. If you choose to apply teak oil, apply every 3 months, or follow the teak oil container instructions. If you choose to maintain the smooth brown finish of your new teak furniture, this method requires some maintenance for upkeep, such as sanding and reapplication of teak oil. Teak oil does not prolong the life of teak , it simply maintains the golden brown color. Please note, once you stain your teak, you cannot return to the natural golden brown or silver-gray color without numerous sandings. Stain is intended to be permanent. If you choose to stain your furniture after it has turned silver-gray, you must first sand it before applying stain. Do not leave teak furniture in puddles of water or on wet groud. Cover your teak furniture during winter months or move into covered area. 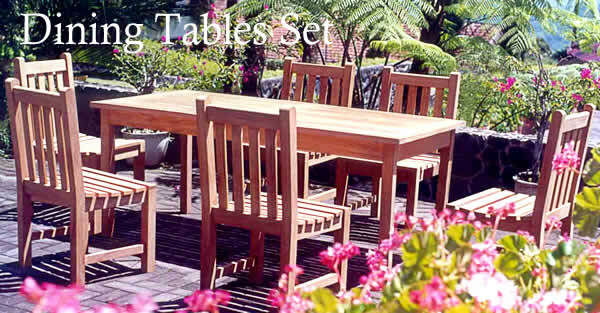 All Classic Teak quality teakwood products are manufactured from Warner Levitzson Teak Furniture specially selected from reserved production forests, carefully managed by the government forestry agency. We use “A” grade teak wood to make our outdoor furniture. Our teak furniture is constructed using advance technologies that are well tested to ensure your furniture delivers comfort and style long lasting. - Top grade properly kiln dried Teak wood used for construction. - All joinery is mortise & tenon and glued with weatherproof glue, further reinforced by dowel joints or solid Brass screws. - All furniture is Machine made. Easy to assemble and flexibility of interchanging parts.